People buy reclining living room set to enjoy ultimate comfort and to rest in a comfy ambiance. This 644KH reclining living room set manufactured by Meridian Furniture is superior in quality, fashionable in style, and has a reasonable price. It has a dual sofa, a Double Reclining Loveseat and a Rocker Recliner chair. These can be purchased together as a set or in any other combination according to the requirement of the buyer. 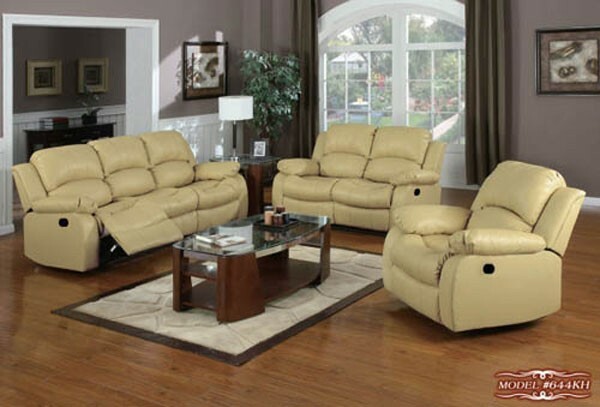 This living room set has very comfortable and appealing beige bonded leather upholstery. The backrest, the seat and also the armrests are padded with plush pillow cushions, giving an optimum ease. The sofa and loveseat of the set is padded with layers of high density foam, for matchless comfort. And, the excellent rocker recliner chair, standing on wooden Leggett has a Platt mechanism for rocking movement. It is thus suitable for any type of home decor. The backs of the sofa, loveseat and the reclining chair are removable.